As Joe wanders through the (incredibly depressing) lobby of St. God’s Memorial Hospital, it is at once familiar but wrong. One of these wrong things is a floor cleaning robot labeled The FloorMaster. It loudly announces “YOUR FLOOR IS NOW CLEAN!” while bumping over and over into a toe kick under a cabinet. (It also displays this same phrase on a display panel.) The floor immediately below its path is, in fact, spotless, but the surrounding floor is so filthy it is opaque with dirt, as well as littered with syringes and trash lined with unsettling stains. It also shows that the people around the machines are failing to notice and do anything about the robot. They are either too dull to notice or this is just so common that it’s not worth doing anything about. It also shows how stupid capitalism has become (it’s a running theme of St. God’s and the rest of the movie). It calls itself the floor master, but in no way has it mastered your floors. In no way are your floors clean, despite what the device itself is telling and blinking at you. And CamelCase brand names are so 1990s, much less 2505. So, I wrote this whole book about agents, i.e. technologies that persistently respond to triggers with behaviors that serve people. It’s called Designing Agentive Technologies: AI That Works for People. One of my recurring examples in that book and when I speak publicly about that content is the Roomba, so I have a bookload of opinions on how this thing should be designed. I don’t want to simply copy+paste that book here. But know that Chapter 9 is all about handoff and takeback between an agent and a user, and ideally this machine would be smart enough to detect when it is stuck and reach out to the user to help. I would be remiss not to note that, as with the The Fifth Element floor sweeping robots, safety of people around the underfoot robot is important. This is especially true in a hospital setting, where people may be in a fragile state and not as alert as they would ordinarily be. So unless this was programmed to run only when there was no one around, it seems like a stupid thing to have in a hospital. OK, chalk another point up to its narrative virtues. Speaking of bots, there is a brilliant bot that you can sign up for to help us resist American idiocracy. It’s the resistbot, and you can find it on Facebook messenger, twitter, and telegram. It provides easy ways to find out who represents you in Congress, and deliver messages to them in under 2 minutes. It’s not as influential as an in-person visit or call, but as part of your arsenal, it helps with reminders for action. Join! After the gravitic distortion is discovered, Barcalow flips a toggle switch upwards with his thumb. As Ibanez confirms that “Gravity is 225 and rising,” the light on the bridge turns red, and Barcalow turns to a monitor. The monitor (seen above) features a video window in the top center. Along the left side of the screen 11 random numbers report the COMM STATS INTERSHIP. Along the right side of the screen 11 other random numbers report the COMM STATS INTRASHIP. 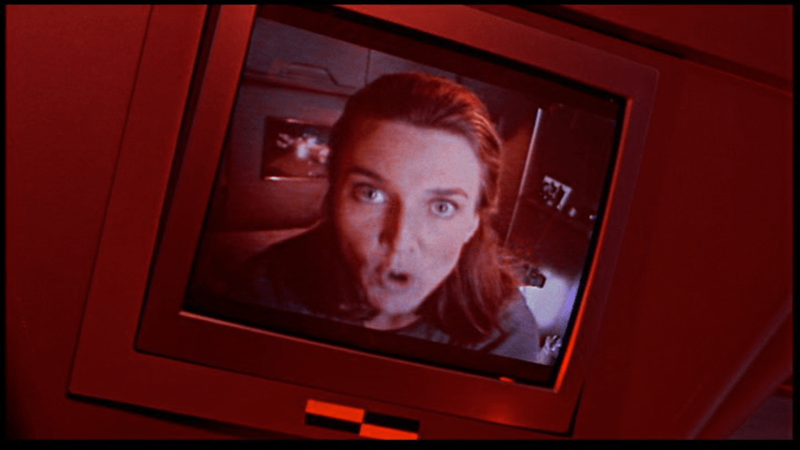 Beneath the video some purple bars slide in and out from a central column of red rectangles. One of these rectangles is bright yellow. Beneath that a section reports SCANNING FREQUENCIES as 21 three-character strings, some of which are highlighted as red. At the bottom of the screen blue and yellow-green smears race back and forth across a rectangle. Everything is in Starship Troopers‘ signature saturated colors and a block font like Microgramma or Eurostile. These details are almost immediately obscured, as Deladier looks up from her laptop (looking presciently like a modern Macbook Air with its aluminum casing) to look at the video monitor to demand a “Report,” and the video grows larger to fill the screen. Here the snarky description must pause for some analysis. The red alert mechanism is actually pretty good. Both the placement of its switch at shoulder level and the fact that it must be flipped up help prevent against accidental activation. The fact that it’s a toggle switch means it can be undone with ease if necessary. The red light immediately provides feedback to everyone on the bridge (and throughout the ship?) that the system has gone into a red alert. No other action is necessary to alert the person who needs to be informed, i.e. the Captain. The only other improvement might be a klaxon warning to alert others who are sleeping, but it’s entirely possible that very thing is happening elsewhere on the ship, and the bridge is spared that distraction. So full marks. The user interface on the monitor seems pretty crappy though. If someone is meant to monitor COMM STATS—intership or intraship—I cannot imagine how a column of undifferentiated numbers helps. A waveform would be more useful to track activity across a spectrum. Something. Anything other than a stack of numbers that are hard to read and interpret. The SCANNING FREQUENCIES is similarly useless. Sure, it’s clear that the ship’s systems are scanning those frequencies, but the three-character strings require crew to memorize what those mean. If those frequencies are defined—as you imagine they must be to be at all useful as static variables—then you can remove the cognitive weight of having to memorize the differences between JL5 and LQ7 by giving them actual names, and only displaying the ones that have activity on them, and what that activity means. Does someone need to listen in? Shouldn’t that task be apparent? And why would that need to be shown generally to the bridge, rather than to a communications officer? And I’m not sure what those purple squiggles mean. It’s nice that they’re animated I guess, but if they’re meant to help the user monitor some variable, they’re too limited. Like the sickbay display on the original Star Trek, knowing the current state is likely not as useful as knowing how the information is trending over time. (See page 261 for more details on this.) So trendlines would be better here. The little sweeping candy colored smears are actually okay, though, presuming that it’s showing that the system is successfully sweeping all frequencies for additional signal. Perhaps a bit distracting, but easy to habituate. It’s nice that the video screen fills the screen to match the needs of the communicators. 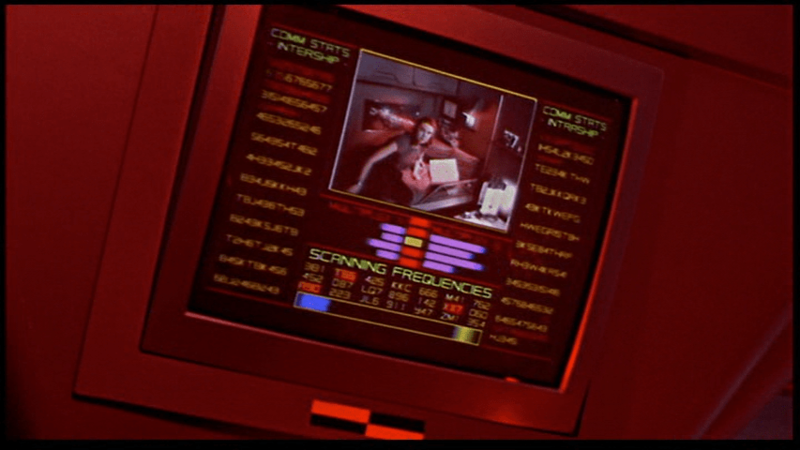 But as with so many other sci-fi video calls, no effort is made to explain where the camera is on this thing. Somehow they can just look at the eyes of the other person on the monitor, and it works. This feels natural to the actors, looks natural to the audience, and would be natural in real life, but until we can figure out how to embed a camera within a screen, this can’t work this way, and we’re stuck with the gaze monitoring problem raised in the Volumetric Projection chapter of the book with the Darth Vader example. So, all in all, this interface is mostly terrible until it becomes just a videophone. And even then there are questions. Picking up the description where I left off, after the Captain demands a report, Barcalow tells her quickly “Captain, we’re in the path of an unidentified object heading toward us at high speed.” Ibanez then looks down at her monitor at the gravity well animation, to remark that the “Profile suggests an asteroid, ma’am.” You know, just before looking out the window. Honestly, that’s one of the funniest two-second sequences in the whole movie. The taxi has a screen on the passenger’s side dashboard that faces the driver. This display does two things. First, it warns the driver when the taxi is about to be attacked. Secondly, it helps him navigate the complexities of New York circa 2163. After Korben decides to help Leeloo escape the police, they send a squadron of cop cars to apprehend them. And by apprehend I mean blow to smithereens. The moment Korben’s taxi is in sights, they don’t try to detain or disable the vehicle, but to blast it to bits with bullets and more bullets. It seems this is a common enough thing to have happen that Korben’s on-board computer can detect it in advance and provide a big, flashing, noisemaking warning to this effect. In many cases I object to the Big Label, but not here. In fact, for such a life-threatening issue, more of the taxi’s interface should highlight the seriousness. My life’s in danger? Go full red alert, car. Change the lights to crimson. Dim non-essential things. You’ve got an “automatic” button there. Does that include evasive maneuvering? If so, make that thing opt-out rather than opt-in. Help a brother out. At other times during the chase scene, Korben can glance at the screen to see a wireframe of the local surroundings. This interface has a lot of problems. 2. How does the wireframe style help? It’s future-y of course, but it adds a lot of noise to what he’s got to process. He doesn’t need to understand tesselations of surfaces. He needs to understand the shapes and velocities of things around him so he can lose the tail. 3. There’s some missing information. If the onboard computer can do some real-time calculations and make a recommendation on the best next step, why not do it? We see above that the police have the same information that Korben does. So even better might be information on what the tail is likely to do so Korben can do the opposite. Or maneuvers that Korben can execute that the cop car can’t. If it’s possible to show places he should definitely not go, like dead ends or right into the path, say, of a firing squad of police cars, that would be useful to know, too. 4. What are those icons in the lower right meant to do? They’re not suggestions as they appear after Korben performs his maneuvers, and sometimes appear along with warnings instead of maneuvers. Even if they are suggestions, what are they directions to? His original destination? He didn’t have one. Some new destination? When did he provide it? Simple, goal-aware directions to safety? Whatever the information, these icons add a lot cognitive weight and visual work. Surely there’s some more direct way to provide cues, like being superimposed on the 3D so he can see the information rather than read and interpret it. If they’re something else other than suggestions, they’re just noise. In a pursuit scenario, you’d want to strip that stuff out of the interface. 5. What is that color gradient on the left meant to tell him? All the walls in this corridor are 350…what? The screen shot above hints that it represents simple height from the ground, but the 2D map has these colors as well, and height cues wouldn’t make sense there. If it is height, this information might help Korben quickly build a 3D mental map of the information he’s seeing. But using arbitrary colors forces him to remember what each color means. Better would be to use something with a natural order to it like the visible spectrum or black-body spectrum. Or, since people already have lots of experience with monocular distance cues and lighting from above, maybe a simple rendering as if the shapes were sunlit would be fastest to process. Taking advantage of any of these perceptual faculties would let him build a 3D model quickly so he can focus on what he’s going to do with the information. Side note: Density might actually make a great deal more sense to the readout, knowing that Korben has a penchant for ramming his taxi through things. If this was the information being conveyed, varying degrees of transparency might have served him better to know what he can smash through safely, and even what to expect on the other side. 6. Having the 2D map helps a bit to understand the current level of the city from a top-down view. Having it be small in the upper right is a sound placement, since that’s a less-important subset of the information he really needs. It has some color coding but as mentioned above it doesn’t seem to relate to what’s colored in the 3D portion, which could make for an interpretation disaster. In any case, Korben shouldn’t have to read this information in the tiny map. It’s a mode, a distraction. While he’s navigating the alleys and tunnels of the city, he’s thinking in a kind of 3D node-graph. Respect that kind of thinking with a HUD that puts information on the “edges” of the graph, i.e., the holes in the surfaces around him that he’s looking at. That’s his locus of attention. That’s where he’s thinking. Augment that. Fortunately, given that the interface has so many problems, Korben only really glances at this once during the chase, and that’s at the warning sound. But if the younger Korben was meant to use this at all, there’s a lot of work to make this useful rather than dangerous. The dispensary is loaded with warnings to get him to quit. Across the top we read 4™ REFILLS. Just below that is a white imperative, QUIT SMOKING. To the right another legend reinforces the principles spoken aloud, 4™ A DAY. A legend across the bottom, written in glittery red capitals reminds him that, TO QUIT IS MY GOAL. Behind the glass tubes is something like a Surgeon General’s warning about the dangers of smoking. Sadly for the crewmembers (and the actors as well) the air inside these bowls are not well filtered and circulated. The inside surface fogs up quite easily from the wearer’s breath. Audio is handled intuitively, with all microphones between spacesuits being active all the time, with an individual’s volume relative to his or her proximity to the listener. Janek is at one point able to stand in front of the ship and address everyone inside it, knowing that the helmet microphones are monitored at all times. There are lights inside the helmet, placed over the forehead and pointing down to make the wearer’s face visible to others nearby, as well as anyone remote-monitoring the wearer with a backward-facing camera. A curious feature of the suits that they also include yellow lights that highlight the wearer’s neck. What is the purpose of these lights? Certainly it shows off Michael Fassbender’s immaculate jawline, but diegetically, it’s unclear what the purpose of these things are. It is after the scientists remove their helmets in the alien environment—against the direct orders of the Captain—it becomes clear that the spacesuits were designed with this in mind. This way the spacesuits can be operated helmetlessly while maintaining identification lights for other crew. The odds of this being a feature that would ever be used on an alien planet are astronomically low, but the designers accommodated the ability to be operated without helmets. Holloway’s left sleeve has two small screens. The left one of these displays inscrutably small lines of cyan text. The right one has a label of PT011, with a 3×3 array of two-digit hexadecimal numbers beneath it. A few of the hexadecimal pairs have highlight boxes around them. Looking at this grid, Holloway is able to report to the others that, “Look at the CO2 levels. Outside it’s completely toxic, and in here there’s nothing. It’s breathable.” It’s inscrutable, but believably shorthand for vital bits of information, understsandable to well-trained wearers. For inputs to the sleeve computer, he has four momentary buttons along the bottom and a rotary side-mounted dial. Using these controls, Holloway is able to disable his safety controls and remove the helmet.